Levant Power Cable Market size for 2016 was valued over USD 3 billion and is set to witness gain over 8% by 2024. Growing investments towards infrastructure development among war affected countries including Syria and Iraq will drive the levant power cable market size. As per, the United Nation, investment of over USD 180 billion is required to rebuild Syria economy to pre-war levels. Similarly, Anbar province in Iraq alone require USD 22 billion for reconstruction. Exponentially increase in the electricity consumption coupled with expansion of transmission and distribution electric networks will stimulate the levant power cable market share. In 2016, Egypt announced the development of USD 1.6 billion transmission corridor project with aim to link with the Saudi Arabian grid network to accommodate the growing electricity demand. Shifting trends towards clean technology to meet the global climate action target will further fuel the levant power cable market share. Countries including Israel, Egypt and Jordan are focussing more towards the deployment of innovative clean energy systems including floating solar. Solar and Wind were the most preferred renewable energy technology in the recent past across the region. In 2015, Israel along with the U.S. Department of Energy had jointly develop Binational Industrial Research and Development (BIRD) Energy programme under, which six projects will collectively get funding of USD 5.1 million. 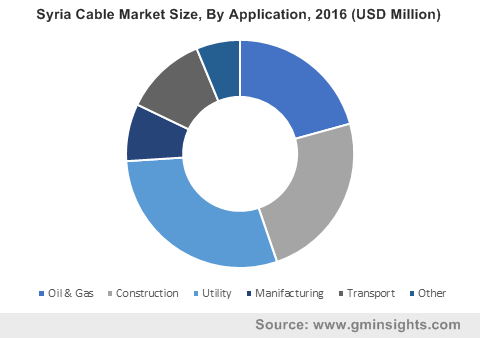 Power cable market is anticipated to exceed USD 5 million by 2024 subject to its wide adaptability across the utility applications. Regulator and public utilities are jointly developing action plans to re-establish T&D network with modern safety features to provide reliable electricity to end consumers. Growing infrastructural spending to rebuild war affected public assets will further boost the product demand. Growing measures to re-establish the communication networks including telecom will propel the demand for data and control cables. 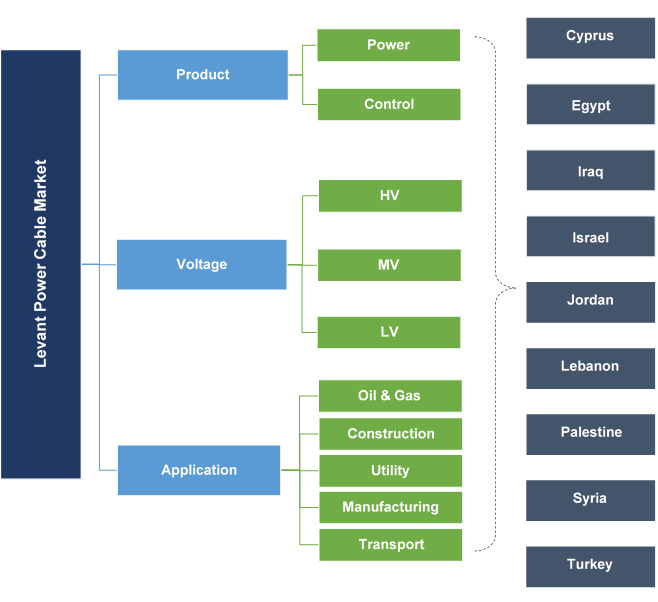 Introduction of IoT and other smart communication networks across manufacturing, mining and upstream O&G will positively drive the levant power cable market. LV and MV in 2016, accounted for over 75% of the levant power cable market share. Ongoing measures toward strengthening of electric distribution network will positively stimulate the business landscape. In 2014, Iraq Ministry of Electricity (MOE) appointed Ventyx, ABB company for supply of state-of-the-art EMS systems to improve the performance and reliability of power distribution network. Growing adoption of sustainable energy to reduce the reliance on fossil fuels will further embellish the industry outlook. Levant HV power cable market is set to exceed 8% by 2024. Growing demand for high capacity and efficient transmission network to meet the industrial electricity need will boost the product landscape. Measures to facilitate inter regional supply of electricity may further complement the business outlook. In 2016, Middle East Specialized Cables Co (MESC) had collaborated with Egypt based Al-Mousa Cables to for expand its penetration among adjoining Levant and North African countries. Utility application share in 2016 accounted for over 25% of the levant power cable market. Rising concern towards the refurbishment of T&D assets will exaggerate the industry size. In 2014, International Bank for Reconstruction and Development (IBRD) funded USD 350 million to Turkey Power Transmission Company (TEIAS) to upgrade the existing grid capability. Oil & Gas power cable market share is set to expand over 10% by 2024. Increasing E&P investments to develop unexplored petroleum reserves will positively influence the business outlook. In 2017, Government of Egypt announced its plan to sign five new agreements worth of USD 154 million with its foreign allies towards the exploration and development of new fields across its western desert region. Cyprus power cable market size was valued over USD 8 million in 2016. Government reforms to attract investments towards the development of country’s unexplored offshore gas reserves will expand the business outlook. In 2016 Government of Cyprus awarded the drilling licenses to Eni, ExxonMobil, and Qatar Petroleum in country’s southern coast. Turkey power cable market is set to exceed USD 2 billion by 2024. Favourable industrial law along with ideal geographic location has always attracted the global investors to invest in. Ongoing expansion programs across energy, transport and communication sector will further supplement the business outlook. Initiatives to restructure their T&D electric network with aim to deliver safe and reliable electricity will drive the Iraq power cable market size. In 2016, Siemens and Government of Iraq had signed Memorandum of Understanding (MoU) to strengthen and modernize the country’s energy infrastructure. Levant power cable market participants include Liban Cables, El-Sewedy Cables, MESC Jordan, Prysmian, Nexans, Belden, KEI Limited, Southwire Company, Sumitomo Electric Industries, The Okonite Company, Oman Cables, Riyadh Cables, Saudi Cables, DUCAB Cables, Nuhas Oman, and Bahra Advanced Cable Manufacture. Manufacturers are witnessing significant downfall in their revenue owing to war conditions across neighboring countries. However, government favorable policies in countries including Jordan, Egypt, Israel, and Turkey will boost the product demand. Power cables are primarily deployed by the utilities for effective transmission and distribution of electricity. Control cable are mainly used by industries for controlling the plant operations. The current civil war situation across the levant countries has significantly impacted public and private assets. Post war economic reconstruction require trillion dollar investments which will influence the demand for wires and cables across the region.